A few days ago I stood at my front window and watched this herd of deer come down the hill next to my neighbors’ house. They were have a rather rough go of it through the deep snow. I feel sorry for the poor things, there isn’t much out there for them to eat with all this deep snow cover. They reached the road and just stood around scoping out the territory. They decided to come through the woodsy part of our front yard, but one small one got curious about the food on the ground that I scatter for the birds and squirrels. He/she approached cautiously. He/she finally decided it was safe and started eating. I know some people hate for the deer to come around because they eat down the bushes and trees, but I don’t mind at all. They can eat whatever they like. Lip-smackin’ good! Pretty soon it took off to join the rest of the family. Yesterday morning I looked up from computer and saw this scene out the window. Only four deer this time and only the one came over to eat. The other three seemed content to roam our front yard. She stayed and ate and ate. She must have been out there for at least fifteen minutes. A short while later I was sitting once again at the computer and caught movement out of the corner of my eye. Imagine my surprise (and delight) to see that the turkeys had joined her! Now, that was a sight to see. 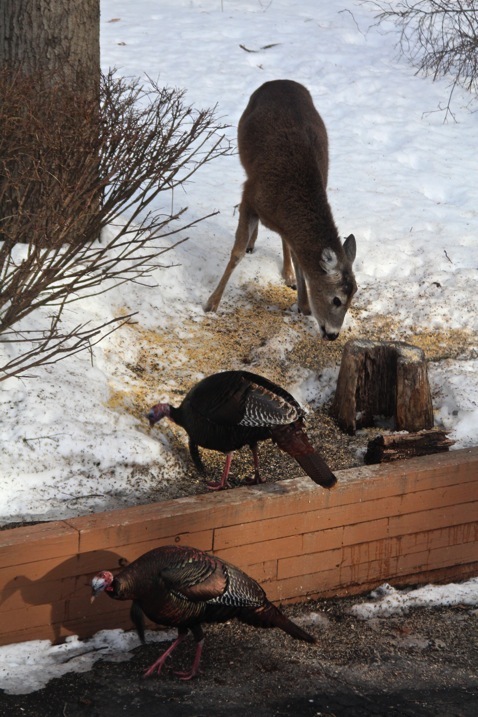 They were not completely comfortable with each other and every time the deer raised her head the turkeys jumped back a couple of feet, but I guess in this brutally cold and snowy winter it’s share and share alike!